Hey Telcos, the new world of penta-play services has arrived! After years of offering only ‘dumb’ voice services to subscribers, we saw a remarkable shift in Telcos’ offerings as they graduated to becoming triple-play and quad-play operators. Today, they have voice, video, data and mobility to offer. But here is another stream of business for them, that is emerging as a new segment and not an extension of an existing service. This adds a new, fifth category of services to their bouquet. I caught up with Cees Links (Founder and CEO of GreenPeak Technologies) about why he thinks ZigBee is a promising technology and has the scope to sustain, in spite of WiFi and other wireless technologies being available. He shared some interesting facts about the requirements of the sensor network that is going to be an additional network in our ‘Smart Home-Office’ environment. In the above picture developed by GreenPeak Technologies, the company explains how this ‘sensorisation’ is going to happen. These would be three, well articulated phases – at the first level will be centralised ‘control & command’ centre to control everything digital in the smart home, which will then add more elements and finally the third phase will result in the Internet of Things. In this scenario, if WiFi is used to provide connectivity between devices, it will raise two concerns. First, WiFi chip inclusion will cost more than ZigBee. On the other hand, a sensor network can be easily created on ZigBee that would connect to the Home Control Box, which could send data over a wired or wireless network. Here, only the Home Control Box would require a WiFi chip and not all the sensors and devices present in the ‘smart home-office’. The other issue is of energy consumption. WiFi would drain sensor battery, whereas ZigBee will consume a fraction of the former. Further, all the devices and sensors in a ‘smart home-office’ need not necessarily be plugged into ‘On-Grid’ power supply at all times. So there is need for a wireless network that could be powered by batteries for years. This requirement creates the need for a low powered wireless technology such as ZigBee. For Telcos, this would mean a way to increase their ARPU by offering network services to run sensors and managing the ‘intelligence’ or ‘smartness’ of devices and gadgets in subscribers’ homes. 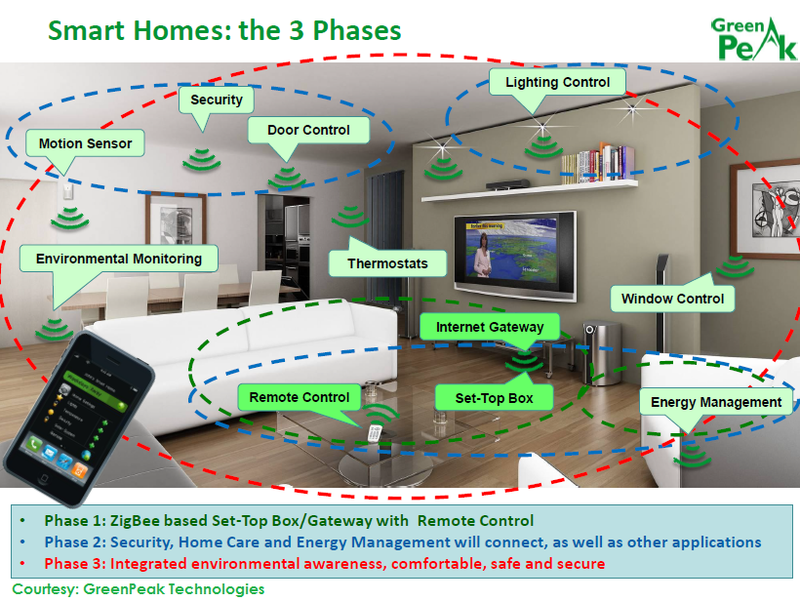 Currently, Set-top Boxes (STBs) have the highest attach-rate with ZigBee technology. Going forward, a lot of devices talking over ZigBee would connect via the STB to the cloud. So, essentially in the entire world of machine-to-machine (M2M) communications, sensors will talk over ZigBee, thereby adding a fifth dimension to the portfolio of services provided by Telcos to their subscribers. Welcome operators, to this new world of ‘penta-play’ services, operators!